Discussion in 'Shops' started by visimpact, Apr 9, 2010.
also, could you post samples of the instructions and maybe some pics of what bikes look like that have had your kit applied . . ? All the tubing used is D.O.M tubing with a wall thickness that exceeds the stock XS frame. If you follow the link to my site there are lots of pictures of the kit being installed and a picture of the bike with the kit finished. But I will post a few more here too. Has anyone bought one of these lately? I bought one and it came as stated. Great little builders kit. I applied mine a little different than the instructions said, but good quality stuff nonetheless. Thanks..tried to buy one on his site but store doesn't work.. Worked for me tonight..kit ordered..thanks! Waiting on my kit. I can't wait!!!! Ok dumb question time. What do you do with the battery in this setup ? You either go kick only with Hughs new all in one kit it makes it simple to convert or u run a battery and put in between the rails. I put it on top of the swing arm in a battery box that is almost the exact width of the battery long ways. My current build I incorporated the battery box into the rear fender as one unit it bolts right to the swing arm. You have to make sure the battery will not hit the rails though with this set up so it takes some layout to get it right. Another trick I've used is to section the the inner tubes and plate them to get clearance for the battery. If u plan it out u can fit all necessary equipment. A lot of people don't want to run batteries though they want that "brat style" look. Any info on the hughs setup ? Just ordered the kit. Just wonder is the no battery system reliable ? I was wondering, it looks like you shocks are 10.5....did they come off a honda rebel? Is the bike in the pics running a stock swingarm or stretched? 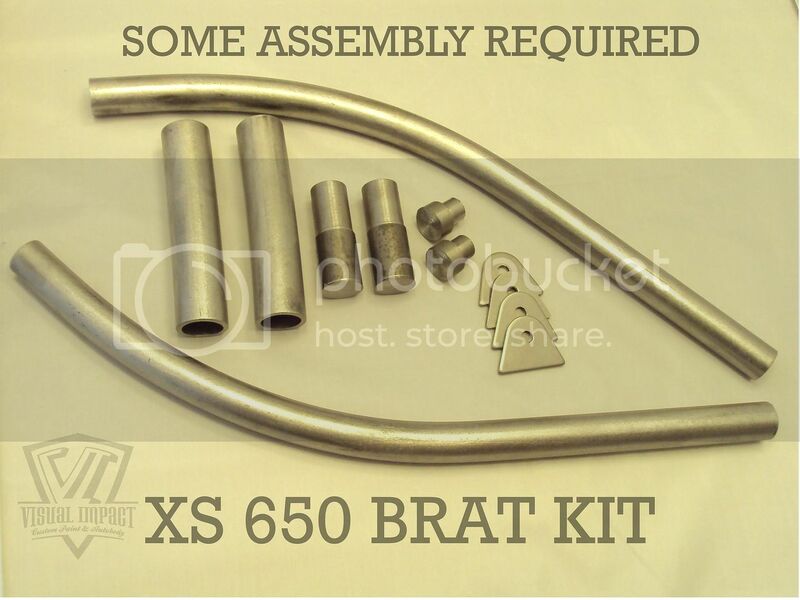 Im sold on the brat style thing and your kit is perfect just getting everything straight and thought out before I step off the edge.. What are your thoughts on the swingarm? to stretch or not to stretch..That IS the question! lol... The stance on this bike is exactly what Im looking for with my 79 special, I would Reallllly love some close up shots of your set up.. esp how you did your shock mounts etc... Thanks man for producing a product a relative novice like myself can use to produce a decent looking custom ride with!! 11 inch Harley dyna shocks. But I don't recommend them. Go with a nice progressive u will be glad u did. That's the stock swing arm no stretch. As far as the shock mounts I'd go with different shocks then the ones in the pics. Most of the progressive shocks readily available all overebay will give u a much better ride and they are mostly a direct bolt in to the swing arm. Will the rebel shocks work OK with this setup ? Any shocks will work with the set up. Im not familiar with how wide the lower mount is on a rebel shock but at the most you would have to widen the bottom mount on the swingarm but again Im not sure if that even needs to be done. Since its a honda shock theres a strong possibility it will fit right into the bottom mount without any work.